Note: The Exhibition Gallery is reopened for visits in 2005. The Exhibition of the history of Belgrade fortifications is situated in the former Austrian or Baroque gate, which was originally built in the first half of the 18th century. The present exhibition has been arranged by the Institute for the protection of cultural monuments of Belgrade and the Military museum. Here you can see some excavated traces of the original pavement as well, in fact a segment of the former road lined with sidewalks. There are three large models presenting all structures of military architecture in the complex of Belgrade fortress. 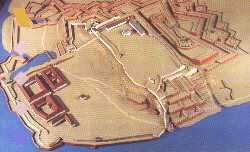 They depict its area disposition, internal layout and a general view of the fortification during the major periods of eventful and turbulent Belgrade's past. Here is the fortress as it looked like in the second half of the 18th century, which is more or less its present-day appearance. When the Ottoman Turks took over the fortress from Austrians again in 1740, they met all previously built artillery structures completely demolished. One of their main tasks was to replace ruins with a new fortification, and those construction works started by the end of 1740. Around 1760 the Fortress was given its final form, preserved until this date. The new Turkish artillery fortress appeared to be just a simplified copy of the forgoing Austrian one for, the Turks had built only the main fortification front with ravelins and a line of glaces, missing out some other also important outworks. Around the end of the 18th century, the Ottoman state revealed growing signs of its internal weaknesses, the situation was additionally aggravated by frequent defeats and military failures of the army. The political atmosphere in the Empire was also reflected in the appearance of its fortress in Belgrade. All travelers who described it at that time agreed that it had been greatly neglected; it had almost fallen into disuse, serving only for protection of local Turkish inhabitants against the rebellious Serbs. All artillery structures which are preserved today, all those built in brick, belong to that last phase in the development of Belgrade fortifications. The first modern artillery fortress in Belgrade was built in the period of Austrian rule, in the first half of the 18th century. Right than, the former medieval fortified town of Belgrade finally disappeared. The project for a Baroque fortress was designed by Colonel Nicolas Doxat (de Démoret). His idea to provide Austrian masters of Belgrade with a modern and sturdy fortification was realized by applying a generally accepted fortification concept of the time, authored by the French military engineer Sebastian Vauban. The construction works lasted for 15 years and surely represented an enormous attempt. For its period, that was a very effective fortification in which high hopes were placed for the further defense of Europe against the Ottoman Turks. Apart from the main bastion or fortification front, various outworks such as ravelins, counterguards, lunettes, trenches, covered walks and glaces were added, thus giving the whole structure a distinctive star-shape. In the same period, Austrians started with construction of a city wall around the town in order to surround Belgrade with additional defensive structures. However, those works have never been completed. After the Austrian army suffered defeat near Belgrade in a new Austrian-Turkish war, the city surrendered to the Turks practically without fighting! According to a clause of the peace treaty, Austrians handed Belgrade over to Turkey but, before they left they had demolished their brand-new fortification. When the Turks entered Belgrade again in 1740, the Austrian artillery fortress and the city wall were already and entirely torn down. The foundation of Belgrade as the Serbian capital and a prosperous fortified mediaeval town in the 15th century took place during the reign of Despot Stefan Lazarevic. He made Belgrade not only the major defensive strongpoint of the country, but also its economic and cultural center. The model depicts a general view of Belgrade in the 15th century with its two fortified areas. The main fortification was situated on top of a bluff (Upper town or Acropolis, rectangular in shape) and reserved for the ruler, his family and nobility of the time. 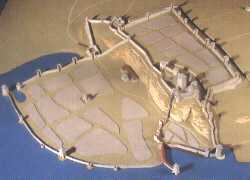 Double ramparts were built all around and additionally reinforced by numerous protecting towers. Approach to the Upper town was possible through four gateways, but today only the East gate (called Despot's Gate) exists and still serves as a passage. In the northwestern corner of the Upper town a small 'inner fortification' was built to accommodate the Despot’s castle. The Lower Town was situated at the foothill, right along the river banks. That was the medieval town of Belgrade with its streets, squares, blocks of houses, churches, hospitals and inns. The city was supplied with two piers, one was military - located on the Sava river, and the other was for commercial purposes on the Danube. As for the cultural life in the new Serbian capital, literary work was particularly fruitful and a whole school of writers, translators and manuscripts copyists was established. In the court premises there was a large library used by the Serbian ruler and his guests, a private chapel and a treasury. The town's further development after the death of Despot Stefan (1427), now again under Hungarian rule, was hampered by the appearance of the Ottoman Turks, who first besieged the city in 1440. There will follow another two sieges in 1456 and 1521, when Belgrade was eventually conquered by the Ottoman army and the sultan Suleiman the Magnificent. The family Lazarevics was called after Lazar Hrebeljanovic, who was the most important nobleman after the Nemanjics disappeared from the political scene of Serbia. Although he actually never ruled entire Serbia which was divided between several families, Lazar was the most influential and the strongest personality. He led Serbian army on June 28, 1389 (The battle of Kosovo) when he was captured by the Turks and beheaded. His wife Milica ruled the country after his death until his son, Stefan became new Prince of Serbia in 1402 and soon received a title of Despot from the Byzantine court. Stefan was under obligation to participate in the Turkish campaigns, his sister Olivera was given to the Turkish sultan Bayazid, but Stefan was always trying to provide his country with a certain degree of independence. While Stefan was responsible for building the new capital of the state, it was as a cultured ruler, a chevalier and a diplomat that he was most influential. And rightly, it is for this that he is best remembered. He simply had no equal in the art of diplomacy and keeping a political balance of power in those days when Serbia found itself by conflicted interests of Turkey and Hungary. He was man of letters as well, he owned huge personal library and loved literature. He was a writer himself. His best-known endowment is Manasija Monastery, one of the most beautiful sacral monuments of the mediaeval Serbia. Its original defensive ramparts are excellently preserved today as a fine example of medieval military architecture in Serbia. Stefan didn't have his own sons so he left the title and named his cousin Djuradj Brankovic as his successor. Stefan Lazarevic died in 1427. There are two small side exhibition rooms. In the left one, one can see some fine exhibits such as the medieval armaments, side arms and war equipment - a few preserved body armors, a mail shirt of exquisite workmanship, two small medieval cannons etc. The entrance to the sally port of the Southeast rampart can also be seen in this space. (This room is not open to the public in 2005). In the opposite room one can see medieval instruments, employed for construction of the fortification (a mattock, an axe, a double axe, a hammer etc.). A crossbow used by despot’s archers is also on display. In the showcase a few interesting exhibits are exposed, e. g. a copy of the fresco painting depicting Despot Stefan Lazarevic (Manasija monastery) and photocopies of two mediaeval manuscripts - the Gospel of Radoslav and the famous Despot’s Mine law. The mining law was enacted in 1412 in Novo Brdo, a prosperous provincial town, where a lead and silver mine was once located. Wishing to secure a detached view on mining matters and to provide Serbia with an objective law, Despot engaged 24 men originating from various towns of Serbia, but none of them was from Novo Brdo itself. Finally, some pottery pieces excavated in the castle’s area of the Upper town (a ceramic jug for wine or water and a ceramic cup) complete the collection. A new guide book to the Belgrade Fortress and Kalemegdan Park, authored by Marko Popovic Ph.D. can be purchased at info offices of the Tourist Organization of Belgrade.